With his first productions, especially with his trio AGOG with whom he had won the Dutch Jazz Competition a few years ago, the Cologne-born Frank Wingold showed himself as an extraordinary electric guitarist, who seemingly effortlessly implemented the qualities of rock guitar into a contemporary jazz setting. He has stayed very contemporary with his new production, this time especially on the acoustic guitar, and shows himself as a master of this instrument as well. Even though he has not yet found an entrance into a larger marketing strategy, he shows himself as a conceptualist of contemporary music. Already the first note makes the listener curious, is reminiscient of a meaningful recording, but already in the next moment, he shows his virtuoso handwriting, and lets one forget everything that has been heard before. He has found himself a worthy partner in the saxophone player Nils Klein, who develops a thousand ideas at once with an exceptional agility, with lightness and a never-ending conversational ability. Somehow, his instruments sound different from what one would expect from the soprano or bass clarinet; it’s simply the Nils-Klein-tone. So it seems no coincidence that this young man has already won all possible prizes by the end of his graduation, for example the Förderpreis des Landes NRW and now also the Förderstipendium für Jazz und Improvisierte Musik der Stadt Köln. The bassist Dietmar Fuhr, Wingold’s partner from the Underkarl times and the young drummer Jonas Burgwinkel are also among the best that the Rhein area has to offer. Even the titles are integrated into the concept. The title track „Clairvoyance“ is characterised by a surprisingly free and confusing transparency, while „Magma“ expands slowly but surely, only to name two of nine examples. To say it again, this is one of the most convincing productions of a German ensemble to date! 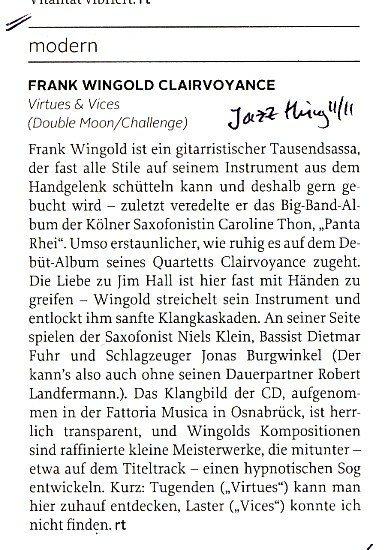 The first impression you get after turning on the CD: Frank Wingold’s quartet sounds very natural; you get the „pure“ sound of four musicians: a guitarist, a saxophone player, a drummer, and a double bass player. The recording is professional; there is almost no use of studio effects. The result is absolutely convincing: Wingold’s quartet makes you listen. The music isn’t necessarily „easy listening“, as the players do not only improvise „inside the box“. The creative eruptions, especially of the two leading soloists – Wingold on guitar and Niels Klein on saxophone and clarinet – occasionally break out of the tonality. And that screams to be resolved, especially when two similarly wild solos are being played at the same time. But fortunately, the happy end follows, and you know by that time that the quartet has immediate control over the action. Wingold plays convincingly not only with the plectrum but also as a fingerstyle guitarist. His compositions are refreshingly interesting. Friendly harmonies experience wild breaks, chaos becomes groove, and from the ashes of the apocalypse emerges something new, something unexpected. Double bass player Dietmar Fuhr supplies the foundation with infallible intonation and impressive rhythmical security. Drummer Jonas Burgwinkel creates the perfect mood to give the often edgy compositions stability and atmosphere. Niel Klein is the counter balance of the band leader, but just as spontaneous and well-versed. The brilliance of this music does not reveal itself during the first listen. But then, after some time, the true beauty of these sounds emerges as if out of a fog. The listener then has his personal Clairvoyance experience. It is worth it to wait for this moment of revelation, because then it might not let you go. Hats off! Frank Wingold took his time. However, it is not out of lack of hard work or inspiration that the 38 year-old guitarist and composer released his debut album so late, as he is also a side man in various projects and a teacher at the Saarbrücken music college. The point is, Wingold is not interested in fleeting success. For him, quality and meaning in music stand far above marketing criteria. That this attitude does not necessary lead to exhausting free jazz extravaganzas, Wingold proves time and again: as a permanent member of the band Underkarl, who are refreshing the jazz idiom in a structurally and rhythmically contemporary way. Or with his own band Leisure Minx, a group that plays sophisticated and yet catchy pop songs. The new album, on which Wingold has played his own jazz compositions, is called „Clairvoyance“. Three other Cologne-based musicians complete the line up: the young star Niels Klein (saxophone and clarinets), the routined Dietmar Fuhr (double bass) and the very promising newcomer Jonas Burgwinkel (drums). The sound of the album stands out from earlier publications, for example his Dutch trio Agog, who’s style is rough, edgy, but relentlessly advancing. The Cologne-based artist FRANK WINGOLD (www.wingold.de) is an award-winning jazz guitarist, a musician who takes tradition and mixes in a lot of individuality to create something entirely new: starting with a very open, acoustic sound, over the subtle but surprising minimal voicings, to the licks that show that Wingold has understood the experimental side of Jim Hall, the warmth of Mick Goodrick and the ingenious Lifetime eruptions of John McLaughlin. ‚Clairvoyance‘ (leicom/konnex) was recorded with Dietmar Furh (b), Jonas Burgwinkel (dr) and Niel Klein (sax, cl, b-cl). You can hear why Frank Wingold has received many awards as a guitarist. His individial playing style sways refreshingly between opposites like ‚elegance and bulkyness‘, ’stylistic reminiscence and modernism‘ or ‚Zappa-esque and smooth‘. His enormous creativity becomes evident in his compositions, which are highly interesting throughout and just as diversified as Franks expressive playing. One gets the impression that the arrangements mirror the composition process. The outstanding Quartet is very interactive. This guitarist knows his instrument and it’s history well – for he does (almost) everything different. Thumbs up! The (…) guitarist Frank Wingold is a consistent opponent of stagnant listening habits. (…) by breaking up conventional compositional structures and refusing traditional sound ideals, they discover a new language. This has an element of violence and destruction, but from the ruins rise new, dauntlessly beautiful soundscapes; the trio develops a new, fragmented aesthetic that comes from deconstruction. Wingold himself sets the tone, a magician on six strings who uses all the potential of the electric guitar between jazz and experimental and all so-called genre barriers. (…) …in order to pull the listener into a vortex of rhythms, harmonies and lines, which reveals the composer Wingold as a highly competent musical cosmopolitan. Ever-present tangible themes of profound beauty between dissolved, amorphous and visionary sounds . In the music of Agog, familiar things are unfailingly broken. Gaping breaks and sudden changes determine the soundscape. But everything is kept in an elastic flux, the tangible just as much as the fragmented. Wingold excerpts the substance from different styles in order to give it his own meaning. The raw dregs are stuck together harshly, with an experimental spirit and a musical delight. The electric guitar knows no secrets in front of him. Wingold plays the guitar in a very sophisticated and smart way. Like a visual artist, he creates a compositional whole by using varying degrees of reduction. This is what art is all about. And during all the experimental joy in harmony and sound creation, it became clear that deep inside the guitarist lives a strong blues soul. In order to show his strong bluesy expression, the guitarist constantly works on sound variations. The tone, the color, and content; it all keeps changing. Exciting technique is combined with arousing expression. Changing sounds, first humid and warm, then harshly plucked, are created by constantly switching between plectrum and fingerstyle. Sometimes he even expresses himself by bending the neck of the guitar, making a note cry and whimper. With an ingenius usage of the dynamic pedal and the ebow he lets notes flood for a long time. Wingold knows how to build structures and to create tension. As an admired sound-experimentalist, he knew how to use the electronics excitingly – for example using an echo to create surreal soundscapes out of muffled sub-terranean or racingly fast sequences. Wingold’s guitar playing possesses a clear, pearly tone, which is reminiscent of ECM guitarists on speed. Their collective improvisations belong to the most exciting moments of the contemporary dutch jazz scene. The development of their spontaneous interactions is different every night. But what remains the same from night to night in the musical ecosystem of Agog is a radical sound expansion: an intimate trio transforms into a huge, six-armed musical monster. Wingold reveals himself more and more as a composer of complex and yet highly stirring music full of surprising changes. One asks oneself where he takes the time to practice his technique. And yet you hear that he does. His playing sounds more bare and edgy than ever, sometimes at the threshold of painfulness. His usage of effect pedals is sparse but effective. Wingold lets his instrument whisper, crunch and sigh. This is one of those records that simply everyone should buy. Incredibly good, ingenious and most of all – and this is really rare – completely eccentric but very accesible at the same time. A chance for listeners of every category, amateurs or aficionados, to expand their musical horizon a few kilometers with truly original music.